Written by a distinguished international scientist, who has made fundamental contributions on the climatic relationship between air pollution and meteorology, the book provides a compendium of realistic examples of air pollution behaviour. After commencing with a general survey he takes us through a study of diffusion mechanisms including pollution from industrial chimneys and road traffic. 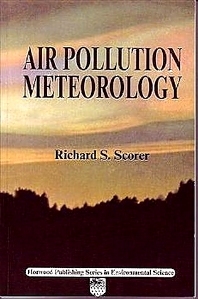 Air pollution meteorology covers boundary layer scaling, pre-processing meteorological data, air quality management, urban meteorology, and atmospheric chemistry (oxides of nitrogen are central to ozone chemistry) with accounts of typical air pollution episodes and a brief dictionary of air pollutants. The meteorological scene; Chimneys: Purpose and design; Dispersal in theory and practice; Acid rain and development of gas washing; Environmental costs and benefits: A matrix for comparison of sources; Technical dictionary of air pollutants; References and index.